“Team of Rivals: The Political Genius of Abraham Lincoln” is, by almost any measure, the most popular biography of Abraham Lincoln. Written by Doris Kearns Goodwin, “Team of Rivals” has been widely read and revered since its publication in 2005. Goodwin is a Pulitzer-Prize winning author and historian who has also written notable biographies of Lyndon Johnson, John F. Kennedy, Franklin and Eleanor Roosevelt and Theodore Roosevelt and William Howard Taft. Although focused on Abraham Lincoln, this book is a skillfully-crafted multiple biography of Lincoln and his three key rivals for the Republican Party’s presidential nomination in 1860. William Seward, Edward Bates and Salmon Chase each became key members of Lincoln’s cabinet, and each contributed greatly to both the strength and the dissonance which infused his administration. How Lincoln harnessed the capabilities of this unique coalition of talented, but fiercely competitive, voices is the subject of much of Goodwin’s analysis. Goodwin’s focus on Lincoln’s willingness to incorporate rivals into his administration, and on how he dealt with their often enormous egos, sets this book apart from the large roster of Lincoln-focused biographies. This interesting angle proves to be the book’s raison d’etre as well as one of its minor weaknesses. Lost to the reader due to the need to jump between the early lives of the four main characters is a more comprehensive exploration of Lincoln’s scrappy frontier upbringing and his intense desire for self-improvement. While benefitting from time spent with Seward, Chase and Bates, it comes at the expense of a richer, more vibrant understanding of Lincoln’s evolution from unskilled laborer to budding lawyer to astute politician and master-of-leader. Those who have not yet read a more comprehensive account of Lincoln’s early life (by Burlingame, White, Donald, Oates or others) will be largely unaware of the missing color. But for a Lincoln aficionado, Goodwin’s description of Lincoln’s early decades of life may seem slightly rushed or flat. Also disappointing for me was Goodwin’s too-efficient handling of the Lincoln-Douglas debates. Where other biographers highlight these debates as the crucial pivot-point in Lincoln’s political progression, Goodwin provides a less enthralling account and seems to underemphasize their significance somewhat. However, after introducing each of the four main characters, Goodwin’s story begins to shine with Lincoln’s election as president. She provides as dramatic and interesting an account of events between Lincoln’s election and inauguration as I can recall seeing. And she presents the best review of the drafting and editing of Lincoln’s inaugural address I’ve read (providing an early but important glimpse into the relationship between Lincoln and Seward, who served as his Secretary of State). Goodwin’s treatment of the volatile Mary Lincoln is the most balanced I have encountered – she is portrayed as a pathologic villain in some biographies and is barely mentioned in others. And as part of Goodwin’s account of the self-absorbed and overly ambitious Secretary of the Treasury, she often (arguably too frequently) highlights the side-roles played by Salmon Chase’s tantalizing and acutely intelligent daughter, Kate. But the most valuable service performed by “Team of Rivals” is its analysis of Lincoln’s relationships with his cabinet members – and their relationships with each other. Rather than diluting the comprehensibility of Lincoln’s presidency, Goodwin’s frequent focus on this group of men enhances the reader’s understanding of events. Where some biographies describe a dizzying array of failed Union generals and unsuccessful military tactics, this biography maintains its focus on the decision-making process in Washington – while not ignoring the battlefield. Although Goodwin spends comparatively little time in pursuit of Lincoln’s assassin once he flees Washington, she describes the audacious plot to simultaneously assassinate Lincoln, his vice president and Secretary of State Seward far better than any other biography I’ve read. And while Goodwin provides few of her own reflections on Lincoln’s legacy, she leaves the reader with a fascinating glimpse into the lives of each of the book’s major characters following his death. 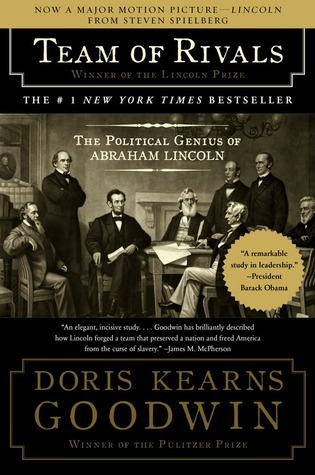 Overall, Doris Kearns Goodwin’s “Team of Rivals” is an interesting and thoughtful exploration of Lincoln’s life with a slightly different focus than is offered by most biographies. This book takes a few chapters to build a full head of steam, but in full flight it is enormously captivating. Probably most valuable to someone already acquainted with Lincoln, it can also serve as an excellent introduction for the Lincoln novice. “Team of Rivals” is both an entertaining story and a valuable source of insight into Lincoln – and not to be missed. Steve, his nomination and election as President is where the book really began to be interesting for me. Lincoln’s leadership style and well as Goodwin’s treatment of how he dealt with the many egos in his cabinet was fascinating. His rivals underestimated him in the beginning. He was an intellect and a savvy politician. Excellent review. Thanks! Sounds like we came to the same conclusion, only you were able to summarize it in a paragraph and it took me a page 🙂 Having read almost 8,000 pages on Lincoln now, I was still surprised to read Goodwin’s description of how expertly he managed the members of his cabinet (both in plain sight and behind the scenes). I have to agree, the nomination is when the book does take off. It’s been a while since I read the book but the focusing on the back stories of each individual rivals became a bit burdensome, I am sure it’s valuable for the entirety of the book but it seemed to labor the text at times as it read like at 5 separate biographies at times rather than Lincoln and his relationship with his Team of rivals The only one I felt was interesting was Seward, maybe a bit of Bates. I remember really enjoying the narrative that surrounded Seward and his “Higher Law” speech . Goodwin’s argument that Lincoln’s superb emotional intelligence was his greatest ability is staggering. Lincoln faced more heartbreak and failure than anyone ever deserves but his perseverance and motivation show how incredible he was. Can you imagine a politician today winning a candidacy and then turning around and placing all his competitors in advisor positions? Only Lincoln could do something like that. A great book, through and through. I recall our current president talking to Doris Kearns Goodwin about the concept of adding rivals to the cabinet, but he seems not to have headed in that direction quite as solidly as did Lincoln, who pulled it off quite masterfully. Not only did Lincoln possess a great deal of self-confidence but he had a great instinct for how to manage people. And Goodwin seems to have crystallized it perfectly. I heard Doris Kearns Goodwin speak a few months ago, she did talk about President Obama asking her about Lincoln and his cabinet. Goodwin said she was considering writing a book about leadership and was trying out some ideas on us. Very cool – would have loved to have been there! Just finished this book. What a great book. It took a while to get into but once I did. It was just captivating. I really like your review. You and I seem to share the same sentiments on the book. Far and away the best presidential biography I have ever read. I have read the first 4 of Caro’s books on LBJ and love them but that is a multi volume work so it is apples and oranges. Then maybe Caro will have finished his next book by then. Every day I pray he doesn’t die first. As of this April, he was still researching it. I am spending considerable time reading all these Lincoln reviews (almost as much as reading one bio). I then read the comments, which now span several years, and provide additional help in deciding which one or two bios to read. One thing I see missing from the comments (not a fault, just an observation) is comparisons between Presidents. Regarding Lincoln and his choice of fractious and egotistical Cabinet, and how well he handled and used them, didn’t Franklin Pierce do the same? According to “Franklin Pierce: Martyr for the Union” by Peter Wallner, Pierce’s cabinet choices (including Jefferson Davis – by God, President of the Confederacy) were doomed to failure, yet stood intact his entire term. Seems Pierce was as good a manager of personalities as Lincoln. But anyone’s thoughts are welcome as I am an amateur in this arena.